The oldest samplers were always on linen and mostly done for practical use. The style was definitely English. One of the oldest known sampler was made by Ann Gower ( Essex Institure, Salem) who became the wife of Governor Endecott before 1628. But this sampler was certainly embroidered in England before Ann Gower arrived in America. Most of the known samplers made in America in the 17th century come from New England. Born in 1650 she married in 1675 a Salem merchant. Her sampler probably dates from 1665 and it is typical of her time , with an alphabet and her name. The style is very close to what was made in England at the same time. Sarah Lord was a New England Maid. Hers sampler, made in 1668, shows a tendency toward shorter and broader samplers. The needle work is very fine. 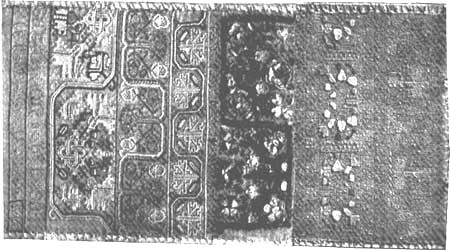 The seventeenth century ended, showing several distinct tendencies in sampler art. Samplers in America were broadening and shortening, they were becoming distinctly less interesting, and the elaborate embroidery of household linen had vanished from the land. Folk were too busy taming the wilderness to attach much importance to the frills and furbelows, and one can feel this distinctly as one realizes how very few samplers American girls did in the seventeenth century.